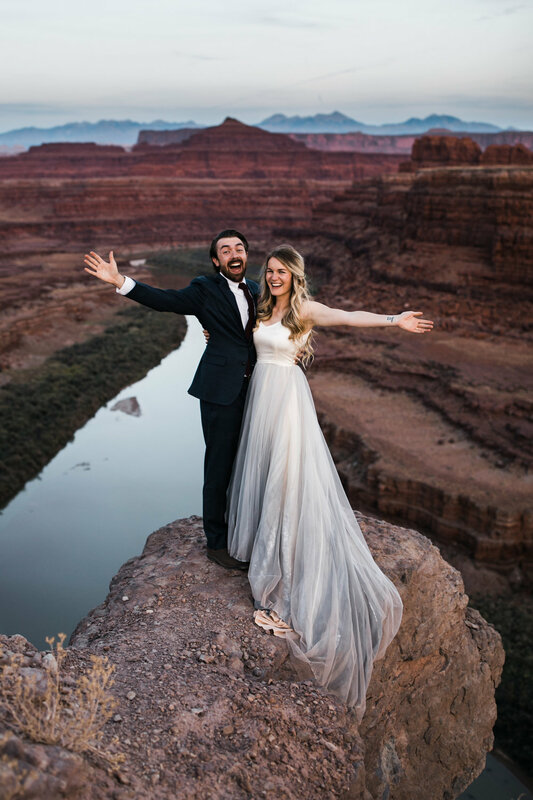 When going through the process of booking a wedding, there's a slow and natural transition where strangers who've found us on the internet become dear friends. This type of friendship is special because we're not just getting to know each other or finding commonalities, we're doing that while creating plans and conspiring together to make something special. We talk in statements of hopes and dreams. We look over maps and create routes. The way the day feels, the peace of mind, the nerves, and anticipation of happy moments all build up inside me to a special point I can only describe as the type work your heart gets behind, so it no longer feels like work. I get to know about their families, their story, and their future and it all matters, it all becomes so important to me. There comes a point when it all feels like a treasure hunt and a party mixed into one. Planning Alley and Jacob's wedding brought about this friendship pretty quickly. Emails felt more like hard copy letters from an old friend. 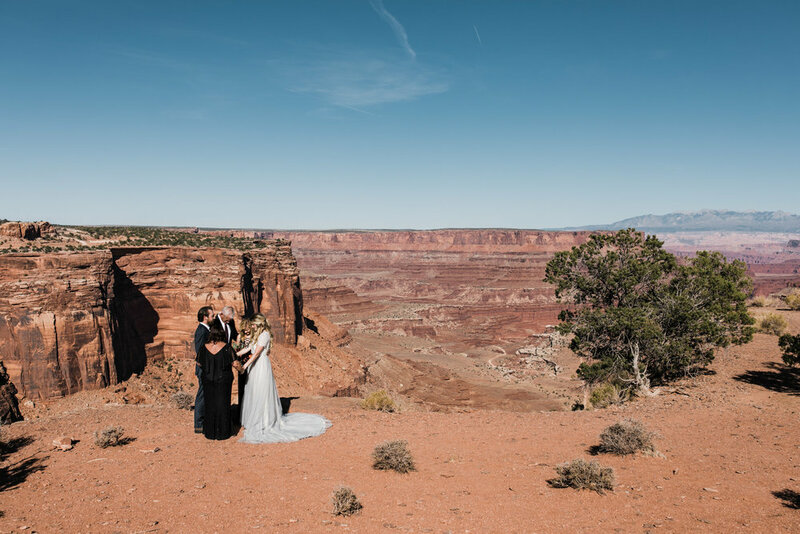 I saw the day unfolding - exploring like characters in a desert fairytale, the excitement of a new terrain welcoming their vows, walking around the sandstone of our favorite painted desert, all the while parents acting as the guests, witnesses, officiant, and friends. I was excited they were coming from Nashville and chose Moab based on photos and stories of ours they'd seen. Couples coming from far away bring about excited energy that I love. Jacob and Alley, along with their parents, were no exception. 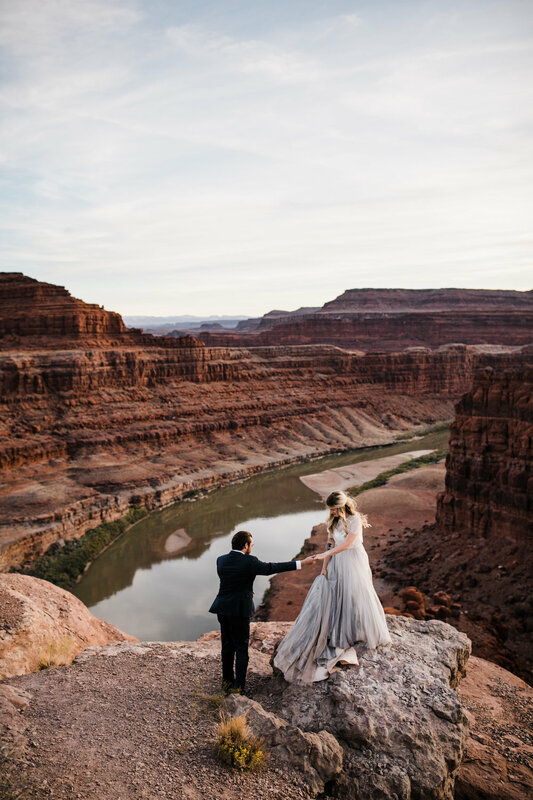 We chose Canyonlands National Park for their wedding location. 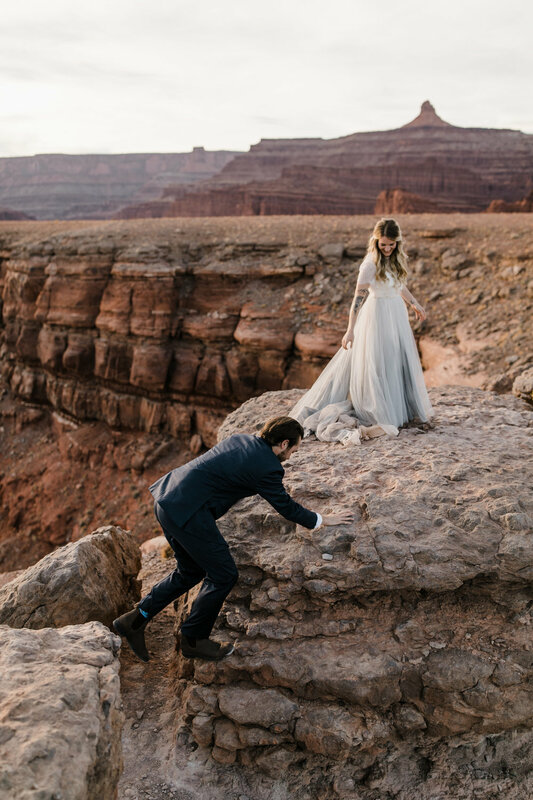 They picked the ceremony spot with us, and we helped with details of the day (lodging, favorite things to see, vendors, and fun ideas for hikes/activities in our favorite desert playground). The actual wedding day took on a special feeling with their parents in attendance. Their atmosphere felt like a little bubble with everything important in the world to this family inside. This tightknit feeling played out the entire day. You could tell the closeness in every small and large act of love. Getting ready for the ceremony and witnessing everything come together brought back tenfold the adventurous feeling of conspiring together. As the ceremony inched closer I thought about closeness - the focus Jacob and Alley had on including their family, how special this was for them. I saw the look in the eyes of their moms, the lifetime of caring which pours out into little moments and details - inspecting the dress, helping with little details, the way they watched Alley when she couldn't see how they were looking at her. Jacob's dad had passed a few years ago, but who he was spoke in who Jacob is. You feel things like this on a wedding day. I loved how Alley's father was there right there with Jacob, helping him get ready, feeling everything with him, proudly standing alongside his soon-to-be son as they put on the finishing touches right before the ceremony. When I think about family, I think about this type of love and togetherness. Alley's dress was so beautiful and unique, desert dust mixed with the colors that literally brushed on by designer Chantel Lauren. Jacob's suit was classic and complemented the Blundstone boots which both he and Alley wore. I thought about Alley's emails to me, how her and Jacob met (shoutout to Bumble for the love win), the five-hour coffee date, how he just fell out of the sky, and she knew he was the person made for her, and vice versa. Alley and Jacob wanted to take some time to be with each other before the ceremony to pray and just be together. I love when couples do this for each other, for themselves, moving slowly to savor the different moments and feels their day has to offer. The ceremony was simple, intentional, and spoke to the type of people Alley and Jacob are. Alley's father officiated the ceremony. It was beautiful. Everyone cried (including me), and they ended the ceremony with their parents praying over them. After, we hiked a little bit and ate sandwiches with their parents in some shade. 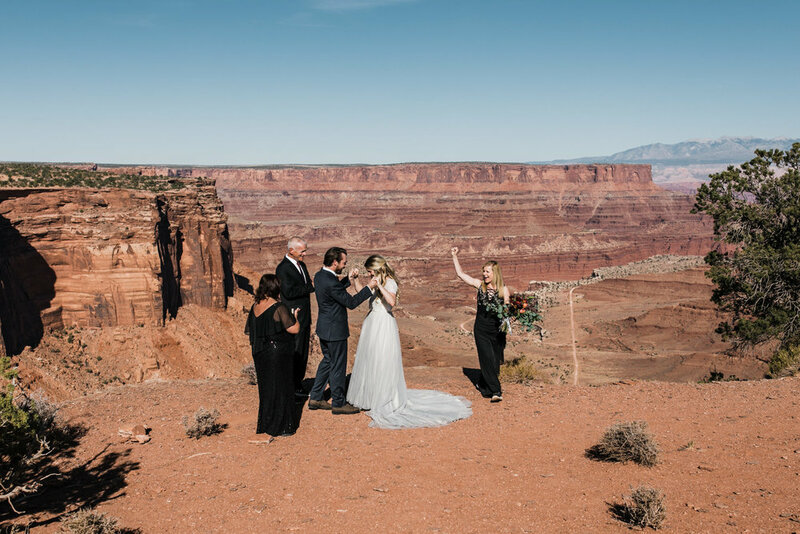 We joked that this was, in fact, the best wedding reception ever. 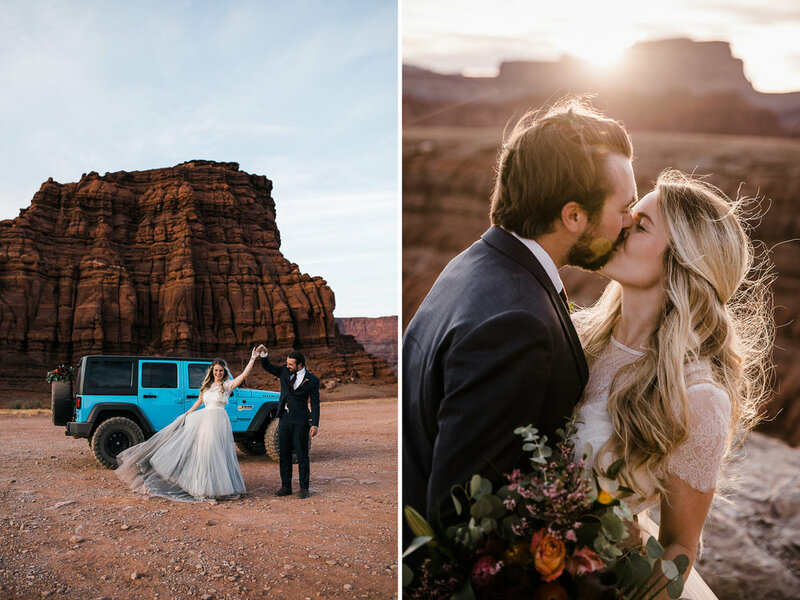 Then we started the second part of their wedding day and piled into a bright turquoise Jeep (here’s another rad Moab jeep elopement we photographed this fall). 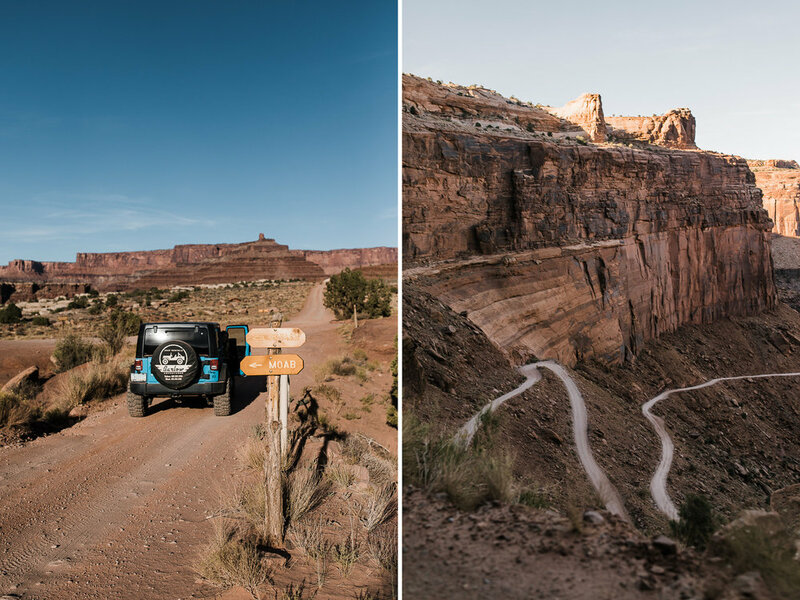 We spent the rest of the day winding down 4x4 roads to explore the area around Canyonlands. We pulled off to explore lookouts and little trails, Jacob and Alley helping each other climb the rocks to cliffs edges. 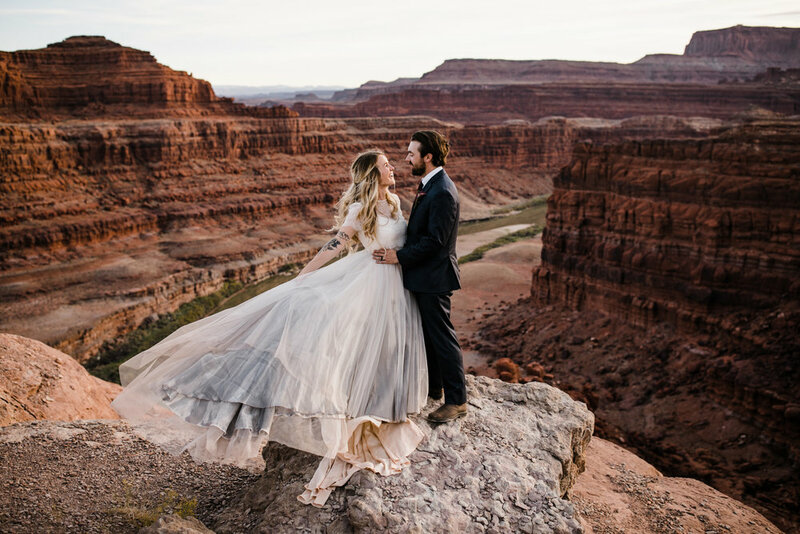 Alley's wish for their wedding day was to shoot in the unique evening light Moab offers. We found a spot with the river below. I was struck with how Alley's dress pulled the elements and colors of the desert pallet together. Everything about this couple - their style, their love, how they looked and how they looked at each other, it was all so beautiful. I could have stayed out with them for days, but as the sun set and the temperature dropped, we drove back through twilight talking about how amazing the day had been. I am so thankful for these two. So grateful they trekked all the way from Nashville. They were an example of how love gathers those around them, holds them close, and creates a moment that meets an emotion. 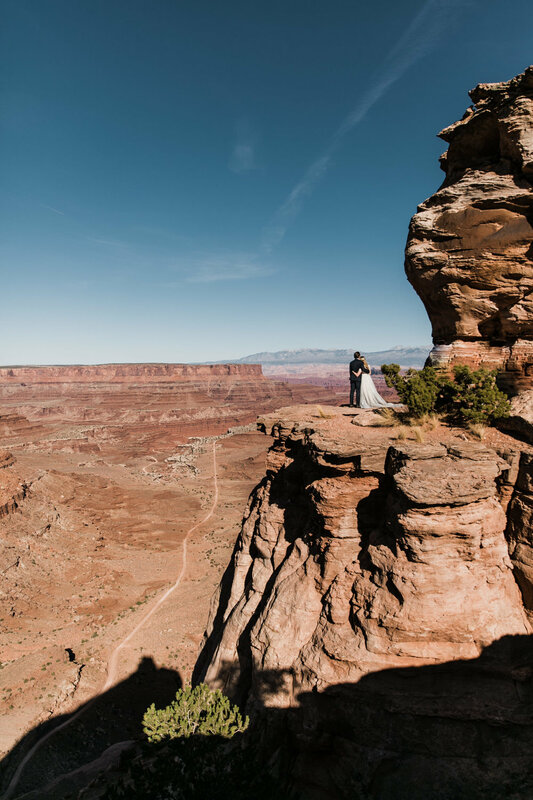 I loved every second of this day and can't wait to someday head to Nashville or have our friends Alley and Jacob come back to Moab.